Daymare: 1998 takes place in the charming town of Keen Sight, Idaho. Here, a partnership with Hexacore Biogenetics ensures the safety and growth of this thriving community. With most of the town’s 27,000 residents happily employed by the company, Keen Sight is an ideal 90’s tourist haven. It’s certainly not the sort of place you’d expect to find horrifying monsters and a grisly demise. Unless, of course, you’ve ever played any Resident Evil game, ever. 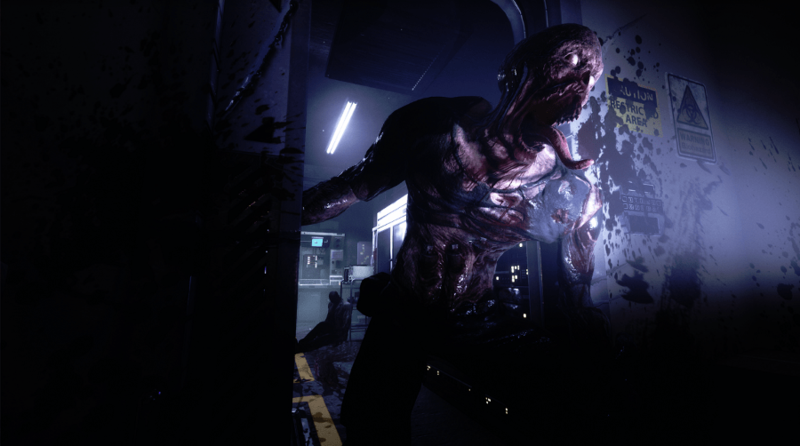 Invader Studios doesn’t try to hide or downplay their passion for the RE series. Instead, Daymare: 1998 takes everything the devs loved about Capcom’s monolith and gives it a quick booster shot of adrenaline. The studio’s first project was meant to be an unofficial remake of the 1998 classic, Resident Evil 2 Reborn. With the announcement of the official Resident Evil 2 Remake in 2015, the future of the project was uncertain. Rather than scrap all their hard work, Invader decided to spin things into their first independent survival horror game, Daymare: 1998. Players will take on the roles of three different characters as they navigate the town and surrounding forests of Keen Sight. Something has unleashed unspeakable horrors on the town, those of the flesh devouring variety. Through each character’s unique perspective players will unravel an intertwined story in their search for the truth. Gameplay follows the standard third-person strategic combat approach fans of the genre are all too familiar with. Enemies are hard to kill and survival is not guaranteed. Despite all the old school callbacks, the game’s graphics are fully modernized. Everything is gorgeously creepy in 3D thanks to Unreal Engine 4. While Daymare: 1998 doesn’t seem to offer anything particularly new or noteworthy in its delivery, it definitely looks like it will be a loving homage to the glory days of 90’s horror. The PC version is coming to Steam this summer with the PS4 and Xbox One versions following soon after. If you just can’t seem to get enough old school survival horror, Daymare: 1998 has you covered.